Keep yourself out of the weather! 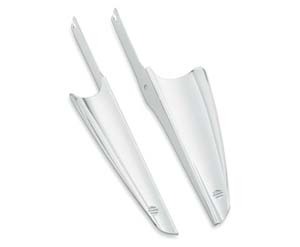 WD-PR: Fork mounted wind deflectors for Project Rushmore. Designed to keep the wind from coming up the front of the gas tank area. Compatible with hard lowers and does not cover lower vents. Made to go under the light bracket. Has the thru hole for the wiring to the spot/turn signal for 2014 year. Available in chrome or gloss black. Special Order. WD-46: Dress your bike for comfort and style. 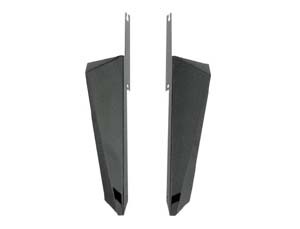 Wind Deflectors extend the windshield's coverage for superior protection in any weather. 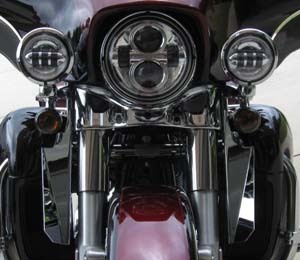 The scooped deflectors are shaped to channel the air flow and direct the rush of air and turbulence around the rider. 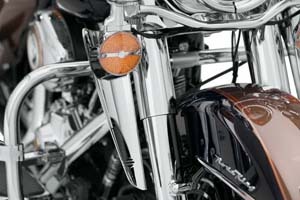 Deflectors attach to the fork brackets for a clean, integrated look. 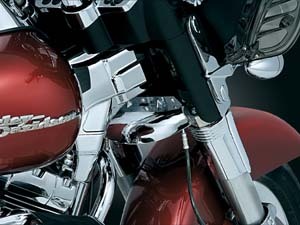 Chrome finish is the perfect complement to polished or chrome front end components. Easy to install kit includes all required mounting hardware. Fits: 2015 Road King FLHR, Street Glide FLHX, Street Glide Special FLHXS and 2014 Road King FLHR, CVO Road King FLHRSE6, Street Glide FLHX, Street Glide Special FLHXS and '95-'13 FLHT, FLHS, FLHR, FLHRC, FLHTC and FLHX models. Does not fit models equipped with fairing lowers, lighted fork slider kit or Custom Auxiliary Lighting Brackets P/N 69227-04A and 68000043. 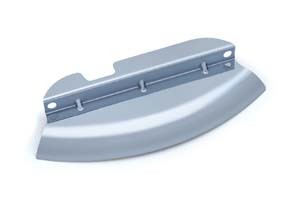 WD-85B: Easily attaches to fork brackets for protection from the elements. Accent the full dress look. 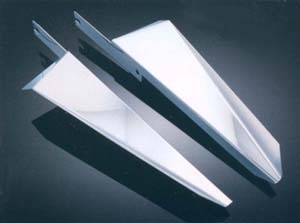 When you hit bad weather, Wind Deflectors keep weather from hitting you. 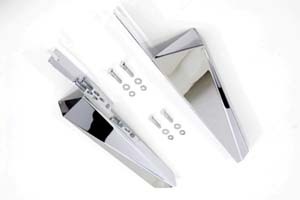 Cold air and rain are deflected out and away by these sleek chrome accessories. They secure with existing fasteners so installation takes just minutes. 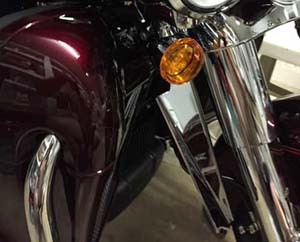 Note: The WD-85B does not fit on bikes with the stock H-D fairing lowers (the Ultra Classic with Lowers) or the Street Glide. Fits 1983 - 2009 FLHT and 1985 - 2013 and FLHR models. (Does not fit models equipped with fairing lowers or lighted fork slider kit.) Does not fit FLHX models or models equipped with Custom Front Bullet Turn Signal Kits P/N 69577-06 and 69492-05. WD-34B: Deflect that pesky wind away from your legs and feet with these guards that easily mount to your front fork brackets. Features: black finish, made in the USA, sold in pairs. Fits: Electra Glide Classic FLHTC/I 1984-2013, Electra Glide Sport FLHS 1984-1993, Electra Glide, Standard FLHT/I 1984-2009, Electra Glide Ultra Classic, FLHTCU/I 1987-2013, Electra Glide Ultra Limited FLHTK 2010, 2011, 2012, 2013, Road King Classic FLHRC/I 1994-2013, Road King Custom FLHRS/I 1995-2012 &Road King FLHR/I 1994-2013. WD-1E: We also offer the WD-1E for Earlier FL and FLH 4-speed models from '60 to '84. 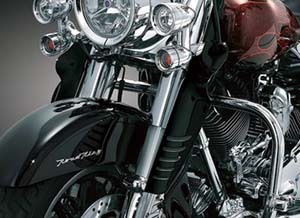 WD-90B: Add the fully-dressed look to Heritage Softail® Classic models. 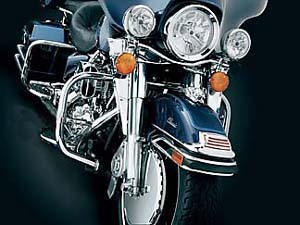 Fits '86-later FLSTC, FLST, FLSTF, FLSTFB, FLSTSE and '93-'96 FLSTN models equipped with Harley-Davidson® King-Size Windshield and/or Passing Lamp Kits. (Designed to also fit with accessory 5-gallon gas tanks.) Does not fit Springer® models. 1311: Added style & comfort for the long haul. 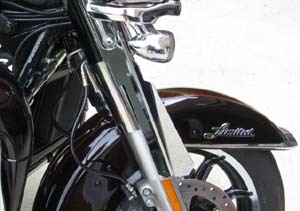 These sleek & smooth chrome bolt-on air deflectors provide just the right amount of air. The sliding vents can be opened or closed depending on conditions. 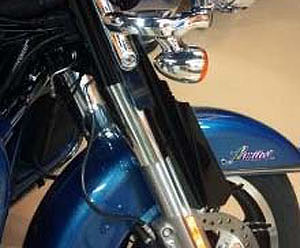 Fits: ’96 - '13 Electra Glides without Fairing Lowers, ’94 to '13 Road Kings (except ’04-’07 FLHRS, ’07-’08 FLHRSE) (pr) Note: Compatible with stock detachable Road King windshields. Will also fit ’06 to '13 Street Glides ONLY IF they are equipped with our Driving Lights (P/N TM-005). WD-31: Similar to above but in Gloss Black. 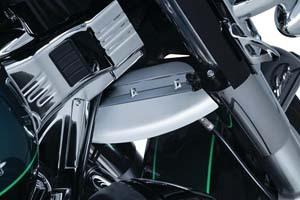 1312: Like above but for Softail platform. 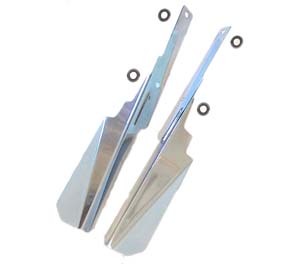 Fits: ’86-’11 FLSTC & ’93-’96 FLSTN (pr) Note: Compatible with stock Quick Release Windshields. 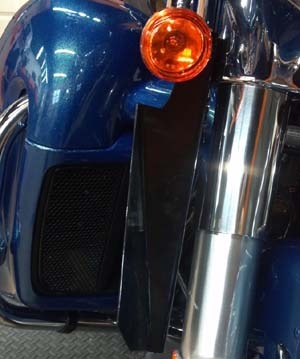 WD-11: Deflect the cold wind away from in-between your legs on your Touring Model with our new air deflector. 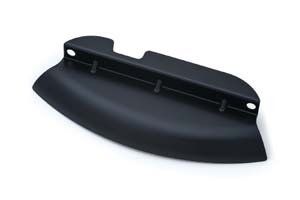 This beautifully chromed deflector replaces the original black wind deflector or makes a great addition to models that no longer have them from the factory. 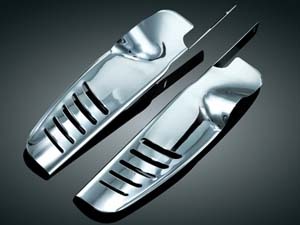 Fits '80-'13 Electra Glides, Road Glides (except '11 FLTRUSE, '12-'13 FLTRU, '12-'13 FLTRXSE), Road Kings, Street Glides & Tour Glides. 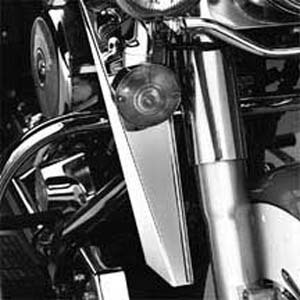 WD-184: Lower Triple Tree Wind Deflectors direct wind passing through the fork legs downward to reduce upward airflow between the tank and fairing on H-D Touring models. 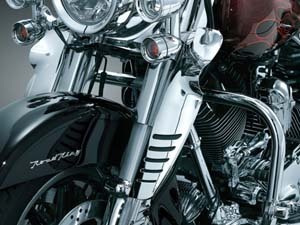 Clean chrome versions are offered for all '80-'16 Touring models and a Satin Black version is also available for '14-later models. Makes a great addition to models that do not have them from the factory or to replace a road worn deflector on a those that did. 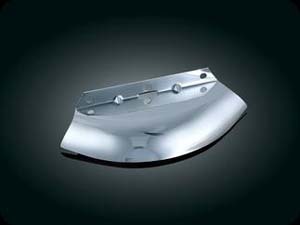 Fits '14-'16 Electra Glides, Road Glides, Road Kings & Street Glides. Show chrome. WD-185: Similar to above but in satin black. 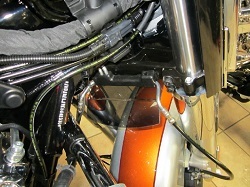 WD-BB: Harley Inner Fork Deflector. Helps block the air that comes in from the fork area that causes the head and shoulder buffeting and mic noise. Works great with our other Wind Deflectors. Hardware available in black only.